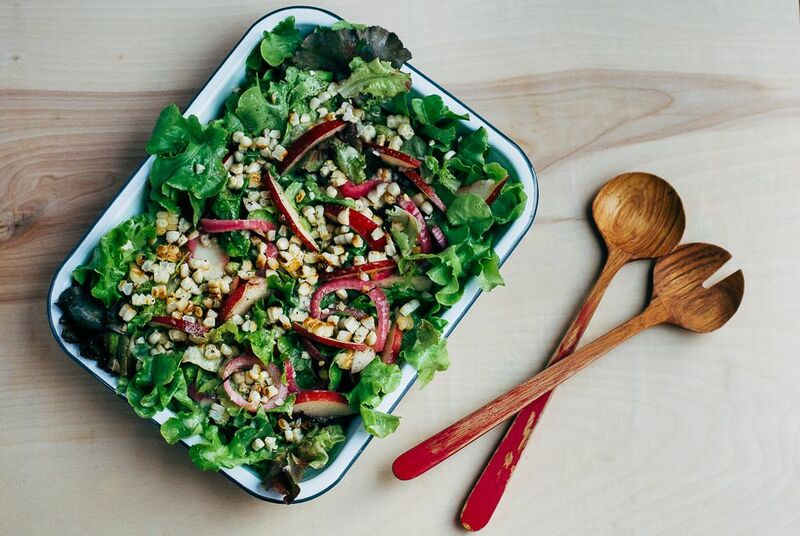 Today: This isn't your typical charred corn salad. My impetus behind placing whole citrus fruits into a blender and pulverizing them into salad dressing was surely laziness. I tried kumquats, eaten whole despite their bitter rinds, first. They made for a predictably sweet and sour dressing; it was incredibly creamy, but with an undeniable punch of sour right at the finish. After kumquats, I moved on to limes. Unlike their smaller kumquat cousins, limes have pith and zest that make for a dressing with a pronounced bitterness. I've found, however, that it can be a nice counterpoint to sweet fruits or delicate lettuces. For my first version of this salad, I went this bitter route, using a whole lime, chopped, in the dressing. I blitzed it with more traditional dressing accompaniments like garlic, sherry vinegar, and olive oil. The resulting dressing was overly assertive, dulling the delicate interplay of every other ingredient in the mix. Still, I sort of loved it. "Is it too bitter?" I asked my husband. "Yes" was his instant reply. Our sour-loving daughters had given up on it, too, so I figured I best head back to the kitchen. On the second attempt, I discarded the skin and pith of the lime and blitzed only the flesh along with the other dressing ingredients. 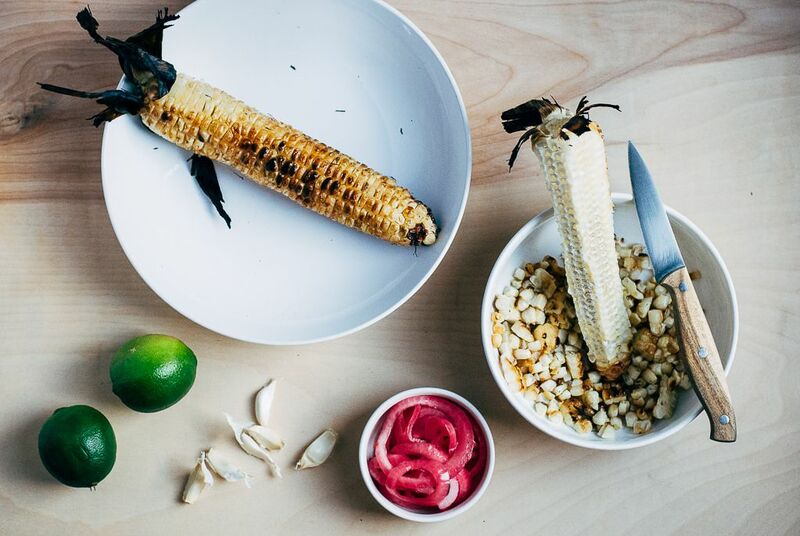 Instead of being bitter, this version had a wonderful, walloping tang, melding beautifully into the smoky-sweet charred corn, the piquant (and pink!) quick-pickled onions, and the sweet white nectarines. This salad may appear strangely incongruous—but the flavor? 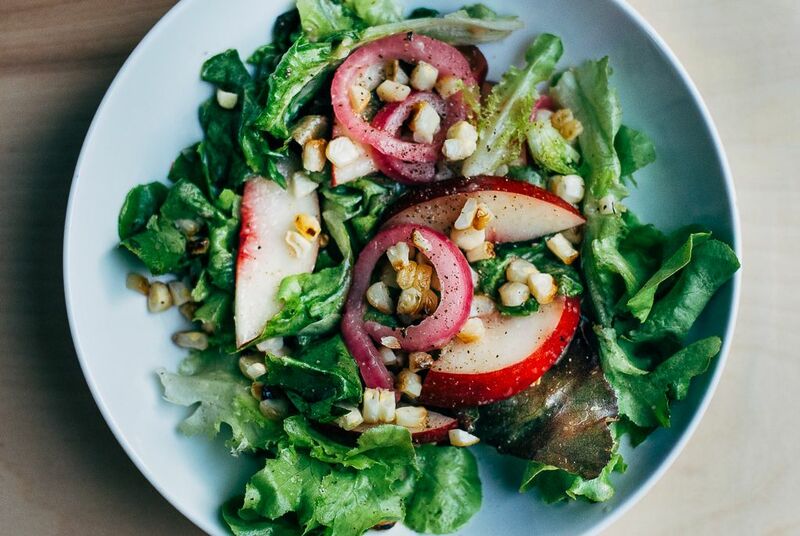 It's surprising and bright and even a little sour, just as a really good summer salad ought to be. By the middle of July, heating up a kitchen by boiling several gallons of water for corn is hardly ideal, and it's just as well, since the best corn is made on the grill. My quick-pickled onions are of the very quickly-pickled variety—made just hours, or minutes, ahead. I've listed the spices I like best in a mid-summer quick pickle, but please, add your favorites here: Bay leaves, sprigs of herbs, star anise, cinnamon, mustard seeds, coriander, and cumin are all excellent options.